Established in 1915, Storage Battery Systems LLC has become renowned for providing DC Power Solutions™ for stationary and motive power applications. 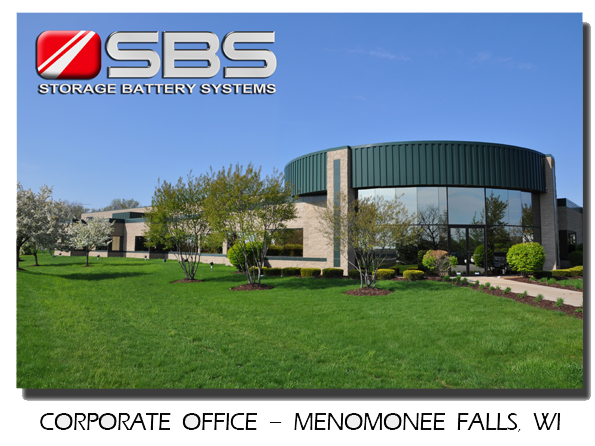 From flooded battery cells, to sealed VRLA strings, from Ni-Cd jars to Lithium-Ion rechargeable battery packs, SBS has developed a reputation for delivering superior performance, expertise and dedication to customer service. At SBS, we offer a wide variety of DC products and services for stationary and motive power requirements that can enhance and maximize the performance for your specific application. Fork Lift Truck Batteries and Chargers – SBS has been manufacturing and assembling lift truck batteries for over 100 years. SBS offers multiple technologies including flooded flat plate, tubular, valve regulated lead acid and lithium-ion. Our batteries are manufactured for all applications and charging technologies including opportunity and fast charging. For charging technology SBS provides Ferro, SCR and High Frequency chargers that are designed specifically for your application. At SBS we have a solution to fit your every requirement. Industrial and Starting Batteries - SBS offers a full line of industrial and starting batteries (automotive, golf cart, scrubbers, generator starting batteries, etc.) – and has been the Midwest Master Distributor for Trojan Battery since 1979. With locations in Illinois, Wisconsin and Indiana, we are able to provide fast and responsive sales and support for our motive power customers in the Midwest and beyond. SBS Telecom line includes both Flooded and VRLA solutions. For rail signal and communications, our VRLA and Ni-Cd products offer superior performance and life. SBS’s in-house applications expertise and willingness to find solutions to fit our customer’s needs is what sets us apart from other battery and equipment providers. Whether it is designing, outfitting and installing custom enclosures for utilities or critical back up power installations, designing and supplying custom utility battery racks for standard or seismic zones, or designing unique solutions for batteries with fit or service restrictions, SBS always works to provide our customers with creative solutions. For over 20 years SBS has been one of the major suppliers of battery test equipment. SBS has in stock and ready to ship battery test equipment including digital hydrometers, internal resistance/voltage testers, load banks, hydrogen detectors and battery maintenance supplies. SBS’s unique test equipment offering provides our customers with the latest technology for battery testing with simplicity of use. In addition to our test equipment products we also fully service, repair and calibrate our equipment in-house. The North American Utility market has been one of our primary focuses for over 15 years. SBS supplies a full line of products to serve the utility market including our full line of long-life low-maintenance tubular flooded batteries (STT series). We were the first company to actively market lead-selenium/low-antimony batteries in the U.S. and combined with tubular positive plates, which is the predominant technology in Europe and Asia, provide longer life and higher capacity than the standard lead calcium products in the market today. Along with a unique alloy, tubular positive plates, and a post seal design that truly does prevent leaking and corrosion at the posts, our SBS flooded series offers superior performance. In addition to the STT Series SBS offers a full line of other battery technologies to support critical infrastructure needs. We have both highly qualified in-house technicians as well as a national network of SBS authorized service providers that travel across the country to troubleshoot problems, perform general maintenance and repairs, and perform new installations. With customers such as Target, Kohl’s, Hyatt, etc. SBS can handle all of your UPS product and service needs. SBS designs and assembles in-house custom battery packs for many applications. Examples include electric battery pack for Arien’s electric riding lawn mowers and snow blowers and Hyatt Hotel key card door locks. We also rebuild DC battery packs for laptops and portable electric tools. At SBS we have highly trained staff to help you customize the right products for your specific application. As technology evolves so does SBS. While manufacturing and customizing unique solutions to fit your needs, SBS also works with world class manufacturers who supply high quality components that SBS assembles in our state of the art manufacturing/assembly operation. SBS has been supplying quality products since 1915.